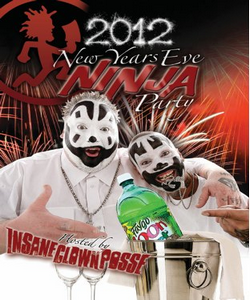 Insane Clown Posse had their first inaugural New Year's Eve Ninja Party at the Palladium in Worcester, MA. Violent J and Shaggy 2 Dope brought in the New Year with a countdown. New Year's Eve Ninja Party. This DVD contains full JCW Wrestling matches, musical performances by Insane Clown Posse, Blaze Ya Dead Homie, Mike E. Clark, and III E. Gal, and even a Michael Jackson impersonator.